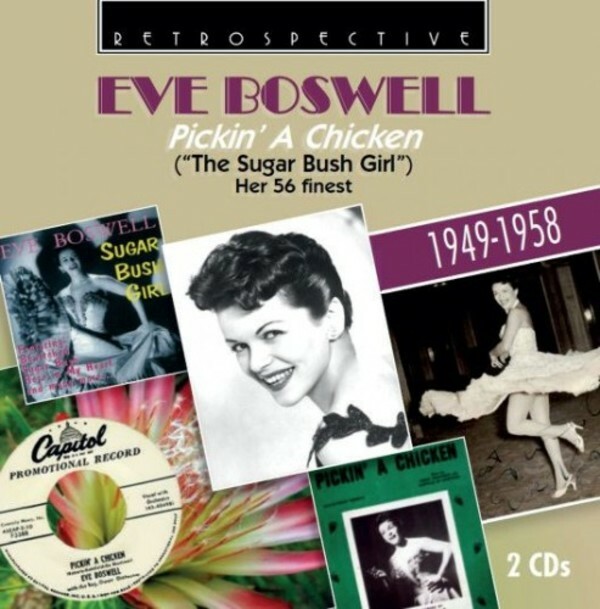 This Retrospective survey of 56 prime items from her recorded legacy reminds us of the sheer vivacity and charm with which Hungarian-born Eva Keleti (1922-1988), aka 'Eve Boswell', lit up the 50s: the 'Sugar Bush Girl' who sweetened all our lives. She brightened up 50s Britain with a welcome touch of the exotic. Here was a sparkling cosmopolitan performer, pretty and exuberant, who brought a dash of warmer, more colourful climes to the black-and-white film of those days. After establishing her career in South Africa, Eve came to England as vocalist with the famous Geraldo’s Orchestra (8 titles here, including I Can Dream, Can’t I?). Her solo career blossomed with a regular string of singles, the most popular of which emanated from Africa: Sugar Bush, Skokiaan and Pickin’ a Chicken (plus 23 others included here). Disc 2 largely concentrates on her fine LP material, showing off the broad range of her abilities. Her breakthrough 10” LP 'Sugar and Spice' is presented in its entirety, together with 12 tracks from 'Sentimental Eve' and 'Following The Sun Around'. The whole programme is the finest available presentation of one of the most gifted and vivacious popular singers of her era. 5. I Can Dream, Can’t I? 7. Where In The World Is Billy?